In the last decades venture capital has emerged as the major source of financing for young and innovative firms, replacing more and more bank credits, but also creating a new market niche for start-ups with a high risk of failure that may create substantial returns. With success stories of companies like Apple Computer, Intel, Federal Express, Microsoft, Sun Mircosystem, Compaq or SAP, this form of funding is meanwhile widely accepted. In the late 1970s the venture capital industry increased dramatically in the United States. In contrast, the venture capital sector in continental Europe used to be a very small market up to 1990. Figure 1 in the appendix shows the development of funds committed to independent US and European venture capital funds. Today the venture fund market in Germany has reached a managed fund size of US$ 43 billion, an increase of 13.2 percent in regard to the previous year. Therefore venture capital plays a crucial role in respect to innovation of an economy and has significant positive effects on society and a country’s economy. According to Sahlmann (1990) the term “venture capital” is defined as a “professional managed pool of capital that is invested in equity linked securities of private ventures at various stages in their development”. Gompers and Lerner (2001a) limit the definition to investments in privately held, high growth companies. Originally, the intent of venture capital is to finance young innovative companies. The term private equity describes the investment of equity in companies that are already established, e.g. companies in later stages of their life cycle. Today the two terms are often used as synonyms. In this paper we keep focusing on companies in early stages of life and thus use the term venture capital only. It should be mentioned that the focus of venture capital firms can be quite different. First venture capitalists can concentrate on different stages of companies (seed, start-up, first, second, third, fourth stage, bridge stage and liquidity stage financing) and second, venture capitalist can finance different industries or focus on a special group. The specialization has the advantage to gather deepened technological knowledge about an industry that can be used within the “venture cycle”. The innovative high-tech sectors, such as biotech or nanotech, would be good examples. These companies are characterized mainly by their small size, their missing past (no significant experiences or track record), their need for equity, their negative cash-flows, high risks (due to a high degree of uncertainty and less possibilities of diversification) and strong focus on the founder (driving force of the development process). This paper intends to give a raw overview to financing young growth companies by venture capital firms. Throughout this work the relationship between the investor, the venture capitalist and the entrepreneur will be further examined. We focus on the economic transaction (primary on the relational problems) and demonstrate mechanisms that mitigate these problems. Chapter 2 explains the multiple agent relationship of the venture capitalist by showing the structure of venture capital investments (Section 2.1) and pointing out the main problems that come up within this double-sided relationship (Section 2.2, 2.3 and 2.4). Based on this fundamentals Chapter 3 discusses incentives and control mechanisms that can be used to mitigate the agency and effort problems. It is split into two main parts that deal with solutions and mitigations of agency problems in venture capital-entrepreneur relationships (Section 3.1) and in venture capital-investor relationships (Section 3.2). Finally, the main findings of this review are summarized in Chapter 4. 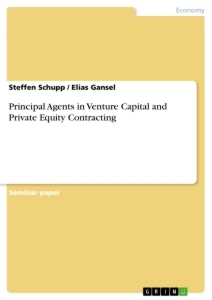 This paper cannot discuss all problems and possible solutions to the numerous venture capital financing problems, because of the highly complex contingencies in the venture capital industry. This chapter explains the relationship between investor, venture capitalist and the entrepreneur, and uncovers problems within this situation. In section 2.1, we describe the relationship between the three major players in the venture capital industry and give an insight into the venture capital investment process. Afterwards, section 2.2 lays the theoretical foundation for further discussion about venture capital financing. The next two sections contain theoretical background from venture capital relationships and describe the main problems that arise during venture capital financing (section 2.3 and 2.4). The organization of the venture capital market has three major players and an assortment of minor ones. Figure 1 shows the double-sided relationship of the venture capital process. Venture capital firms are intermediaries between investors (the capital suppliers) and entrepreneurs (the founders or investees). The venture capitalist typically serves as general partner and the investor as limited partner (relationship A). The capital of venture funds is committed by the limited partners, who are typically pension plans and life insurance companies but also endowments, banks, corporations and wealthy individuals. Unlike the investor, whose liability is limited to her committed capital, the general partner bears unlimited liability. Venture capitalists are responsible for managing a partnership’s investment and contribute only a small fraction of the partnership’s capital personal (around one percent). Hence, the important part to investigate is the amount of effort that they invest into the partnerships to increase the value of their portfolio. This effort is primarily put into the relationship between venture capitalist and entrepreneur (relationship B). Therefore capital commitment is only one part of the relationship and consulting the other one. According to Houben (2002) the effort in consulting of a portfolio company is the main difference between venture capital financing and standard debt or direct equity financing. It plays a crucial role considering the return on investment. On average a venture capitalist spends more than one hundred hours a year in consulting a portfolio company. Generally they become a member of the board of directors and support the entrepreneur primary in respect to establish tactics and strategies or recruit or dismiss key individuals. Only in some cases he is involved in the day-to-day operations. This effort of the general partner is not compensated in cash. The compensation of the venture capitalist can be divided into two main parts, the management fee, and some percentage of the profit in the life of a fund. Typically management fee increases annually with the rate of consumer price inflation. Sometimes a third relationship is mentioned in this context, the intra-organizational relationship between partners and employees. Most venture capital firms consist of general partners and personnel that mainly support them in administrative work. They are organized as management companies, i.e. several pools of capital are managed by few people. Due to considering this as a standard employer-employee problem it will not be discussed in this paper. Certainly this can be said about the portfolio company and its staff, too. To understand the relationship of investor, venture capitalist and entrepreneur it is necessary to understand the venture capital cycle. The first step of the venture capitalist is to develop an investment strategy and find potential capital suppliers, e.g. for raising a fund. Each partnership has a limited lifetime, which is mostly ten years. The success of fund raising depend primary on the vibration of the public market and according to Prowse (1998b) also on the reputation of the venture capital firm. Typically the number of limited partners that commit capital to the fund is not fixed, but mostly varies between ten to thirty investors. On the other hand the portfolio companies which are funded typically consist of ten to fifty investees. The fundraising process is followed by the investment process. This one is distinguishable in the collection of information about potential portfolio companies, checking whether these companies meet the criteria of the investment strategy and than negotiate about investment condition with the portfolio companies. After the investment has been made, entrepreneur and venture capitalist try to increase the value of the company. The last stage of the “venture cycle” is the exit of the investment. Five main groups can be classified: initial public offering (IPO), acquisition exit, secondary sale, buyback exit and write-off. Typically, the most profitable exit opportunity is an initial public offering; however the administrative costs and requirements for information disclosure are high. In general, this process repeats itself, after three to five years, when the investment phase of the existing partnership has been completed. Thus the investment is a continuous process. One of the most stated a fact concerning the relationships in the venture capital business is an inevitably high degree of information asymmetries. Reasons can be found in the nature of venture capital financing. The founder of a young growth company has a venture that needs to be financed. The missing track record, the high share of intangible assets of the young company makes it difficult to measure the risk of the venture. On the one hand external risk is present for all three players of the venture capital business. The uncertainties are governed by the highly volatile market for young companies. Additionally, a second risk component arises during the time of the partnership agreement. The internal or behavioral risk is in contrast to the exogenous risk (risk of the market) suggestible through the venture capitalist and the entrepreneur. The behavioral risk is caused by the problem of different interests among the contracting parties. The incentive of each party is to maximize their respective utility. The party with superior information will use them and behave opportunistic. The less informed party reacts to this opportunistic behavior by anticipating the opportunities of the better informed party and determine her actions or incentives. The information asymmetry, the different interests and the cost due to the information asymmetry form the original foundation of the principal-agent theory. The agency problems can be distinguished in three categories, (1) the adverse selection problem, (2) moral hazard and (3) the hold-up problem. The three terms are described in the following paragraphs related to the venture capital business. In generally the agency theory considers a situation where one party of the contract having less information (principal) would like to delegate the party that is better informed (agent). The agent can use her superior information to maximize private benefits with the result that the principal loses welfare. This part of the benefit is the internal risk of the relationship and is governed by the agent. The agency theory distinguishes between two types of information asymmetry, hidden information and hidden action. Hidden information happens at the time of contracting, if one person is better informed than the other. In case of a wrong decision of the principal which is caused by the hidden information, the problem is known as adverse selection. Hidden action results after contracting, because individual actions cannot be observed by the other party. Holmström (1979a) quotes the unability to observe, as the source of moral hazard. The problem of observability can be improved by investing resources into monitoring and contract design (section 3.1.2). The costs that arise through aligning the interests are called agency costs. Jensen and Meckling (1976) define the agency costs as the sum of (1) monitoring costs, (2) bonding costs, and (3) residual loss. The residual loss is the reduction of welfare caused by the agency problem. According to Jensen and Meckling (1976) monitoring and bonding include, besides observing the behavior of the agent, the effort to control the agent (see section 3.1.3). That means the costs are non-pecuniary as well as pecuniary with the purpose to adjust the divergence of interests of agent and principal. Agency costs are mostly limited by the utility function, so that monitoring for example won’t be performed continuously, because costs would increase prohibitively. In respect to the measurement of agency costs it has to be stated that it is difficult to determine them. The problem is not to measure the monitoring costs or the costs of signalling, difficulties arise by quantifying the difference between the first-best alternative and the second-best one. The other problem that can occur in context of information asymmetry and contractual engagement is hold-up. The hold-up problem describes the opportunistic usage of gaps in incomplete contracts. Three factors that can cause hold-up: (1) A delegational relationship, (2) investment of external capital and (3) the appearance of sunk costs. In this relationship the venture capitalist acts as principal and the entrepreneur due to her superior information as agent. The venture capitalist is the investor that may provide the funds for the venture of the entrepreneur. The first problem in this relationship arises during the selection of the entrepreneur by the venture capitalist. Reasons for the selection problem are different qualifications among entrepreneurs. The entrepreneur knows her project best and has the incentive to overstate her position, because she may obtain a bigger stake in the financial return of the company or get a lower discount rate. If the venture capitalist tries to preselect by using very high discount rates, he might have the unintended effect to scare away the most competent entrepreneurs to seek for alternative capital sources like dept financing. A counterproductive result could be the adverse selection in a pool of entrepreneurs that have no other financing options. More recent literature like Houben (2002b) analyses in context to venture capital relationship the adverse selection problem from a double-sided point of view. It is obvious that the entrepreneur has much more information about the technical part of the project. On the other side the venture capitalist may have much deeper insight into the economic quality of the project, i.e. he knows if there might be a market for the project or not. The statement of Gorman and Sahlman (1989) that venture capitalists are screening several hundreds of investment proposals each year confirms the difficulty of the adverse selection problem. see among others for a deepened analysis of European venture capital market in compare to the US market Schmidt and Wahrenburg (2003h), and especially for the German market in compare with the US, UK and France market Franzke (2003e). see for more details BKV (2005). The Development of the fund portfolio of the BVK members and considered non-members in the time between 1991 and 2004 is shown in Figure 3, appendix. see for more details Duffner (2003d), pp. 7-12. These definition differences form the German understanding of venture capital. See for a discussion on this among others Franzke (2003e), pp. 7-8 or Betsch (2004a), pp. 72-75.
 see for a more detailed discussion Groh (2004d), pp. 16-17.
 see among others Plummer (1987), pp. I-11 to I-13 or Betsch (2004a), pp. 75-76.
 see for more details of the “venture cycle” Gompers and Lerner (2001a), pp. 152-162 and section 2.1.
 see Duffner (2003d), pp. 6-7. Intermediaries are institutions that have two independent relationships. They get cash inflows form the relationship with the capital suppliers and pass the capital to the demanders. Thus intermediaries cut the direct relationship between capital supplier and capital demander; see Duffner (2003d), p. 79.
 see Barry (1994b), pp. 12-13 points out that there are other possible venture capital organizations and the association with performance is not discussed. see Sahlman (1990a), p. 488.
 see Gorman and Sahlman (1989) found in a survey that venture capitalists spend roughly half of their time monitoring an average of nine portfolio companies, which are 110 hours per year per each portfolio firm. The compensation can be compared with “sweat equity”. The term “sweat equity” is used in context with incubators and describes a compensation of services by obtaining a share of the enterprise. Incubators are organizations that are specialized in providing start-ups with services like physical space, coaching, common services and so on; see for more details Bergmann (2003a) section 5.2.3.2.
 see for more details section 3.1.2.
 see Prowse (1998b), pp. 28.
 see among others for a deepened study Duffner (2003d), pp. 23-27, Gompers and Lerner (2001a), pp. 152-162. For an example see Sahlman (1990a), p.473. The uncertainty and the mostly negative cash-flow of a start-up company are essential reasons why other types of financing are probably not possible. Internal financing is not possible because of the low or negative cash-flow. The possibility of dept financing is generally thinkable, but regarding to the high uncertainties the development of young growth companies, their missing track record and the conservative strategy of the banking industry, rather a virtual for the founder to finance her venture with dept. The other disadvantage of dept is the interest which has to be paid on a regular basis. Duffner (2003d). Brettel, Thust and Witt (2004b), p. 6.
 see Duffner (2003d), pp. 33-35.
 see among others Bergmann (2003a), p. 75. Adverse selection is also known as the lemon model, because of Akerlof’s pioneering work which considers the used-car market and only the seller of a used car knows if the car is a “lemon” or not. In markets where buyer can not judge the quality of the offered products ex-ante, the buyer will pay the average quality in the market. On the other side the suppliers do not have anymore the incentive to sell good quality products on the market, because their superior product quality is not recognized. This leads to a drop of the average product quality on the market, which can lean to the breakdown of a complete market. In other words the hidden information influences the decision of buyers. Holmström (1979b) studied efficient contractual agreements in a principal-agent relationship by assuming different possibilities of observation. His conclusion is that the collection of additional information (by using an information system) can generally improve the contract. Moral hazard or incentive problem originate in the insurance literature. It describes the situation where it is either impossible or too costly to observe actions. Moral hazard mostly arise when individually engage in risk sharing under conditions such that their privately take actions affect the probability distribution of the outcome; see Holmström (1979b), p. 6. We refer to bonding costs, when the agent has to prove at his own costs that moral hazard should be of no concern to his principal. This can happen by regularly reporting or voluntarily auditing of third parties by using other companies’ reputation; see Duffner (2003d), p. 66.
 see Duffner (2003d), pp. 36-37.
 see Spremann (1990b), p. 9. Figure 2 in the appendix gives an excellent overview of external and internal risks in regard to moral hazard, the adverse selection problem and the hop-up problem. Assuming that the value of the contribution of the entrepreneur to the project increases (see Houben (2002b) p. 1. Heterodoxe Wirtschaftspsychologie. Wie verhalten sich Menschen an den Finanzmärkten?